This is the third installment in Response’s series on the history of Alexander Hall, Seattle Pacific University’s oldest building, coinciding with the building’s renovation — and its designation as a Seattle historic landmark. We also invite you to visit spu.edu/alexander to discover more about the Restore Alexander Hall project and how you can participate in the current campaign to raise $6.2 million from alumni, friends, and those who treasure early Seattle-area architecture. 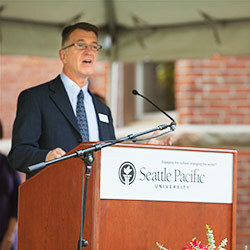 Your gift will make a big difference to this and future generations of SPU students. The newly remodeled Alexander Chapel holds a weekly service of prayer and Communion each Friday afternoon. When it was the only building on campus, the stately red brick edifice of Alexander Hall provided seed and soil for everything that would become Seattle Pacific University. As the grounds, buildings, academic programs, and student body expanded, Alexander became primarily a residence hall. By 1967, the dormitories were gone and Alexander was now home to faculty offices and academic departments, and hospice to student pilgrims making the climb to those offices. Some traveled there, and do still, in quest of scholarly assistance, others in search of emotional and spiritual remediation, many seeking both. In the ensuing decades, there has been something almost sorcerous about that climb, up those stairs, making one’s way down a hallway from Dead Poets Society, then entering the sanctum sanctorum of a professor of theology or history or geography. There was something womblike about sitting in the buttery glow from the professor’s desk lamp, a blustering Northwest day beating against 19th-century turrets’ windows. For close to 50 years, students have made that quest for knowledge, clarity, counsel, and whatever otherworldly graces might be dispensed by the men and women with doctorates and libraries of knowledge who inhabit the first and oldest building on campus. Dean of the School of Theology Doug Strong speaks at Alexander Hall’s rededication. They were and are lucky ones, those students and teachers of religion, speech, drama, and Christian education; scholars in pursuit of history, economics, sociology, psychology, and missiology; academic excavators of anthropology, philosophy, and the classical languages. All at various times have found learning and enrichment in Alexander’s hallowed halls. Or the equally fortunate Rick Steele, professor of moral and historical theology, who worked his alchemy by seating his students in “Dr. Steele’s Blue Chair,” as overstuffed and dilapidated a piece of furniture as has ever been scrounged. Many swore by its enchanting properties so strong that when in its clutches, otherwise composed individuals gladly spilled their deepest disquiet. Associate Professor of New Testament David Nienhuis ’91 has experienced Alexander magic of another kind. He shared a wall with Professor of Educational Ministry Bob Drovdahl ’71. Because the radiator heating in the building was unpredictable, people on the top floor typically perspired, while it was not unusual for those on the first floor, such as Nienhuis and Drovdahl, to experience temperatures in the 50s and low 60s. On cold days, they required space heaters and that’s when things became interesting. Once home to radio station KSSR, Alexander Hall was named to the Washington State Register of Historic Places in 1972. Gone the way of the dormitories is the old chapel, which once occupied two-thirds of the second floor and doubled as the college church, general assembly hall, and the place where literary societies convened. In 1892, the Seattle Post-Intelligencer reported that partition folding doors for recitation space were situated in such a way “that the entire floor, including the corridor, may be thrown into one big room” for school gatherings. Today, Alexander Chapel in the northeast corner of that once large space seats 25 in an intimate room for prayer and reflection. 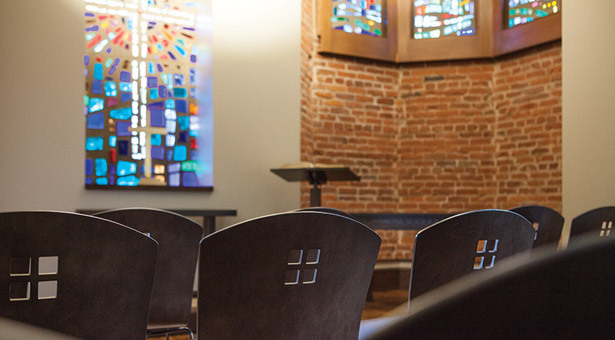 While the quirkiness and technical difficulties of former eras have been addressed by Alexander Hall’s recent $6.2 million historic restoration and seismic retrofit, the building’s storied past lives on in countless hearts of SPU alumni and faculty. Classic Alexander is today’s academic center for the School of Theology and Seattle Pacific Seminary, and the departments of history and sociology. Whether best remembered as hallowed ground or funky domain, Alexander Hall, new smell and all, remains the iconic architectural centerpiece for the University’s commitment to engage the culture and change the world. Update: This article has been revised to reflect the renovation campaign goal of $6.2 million.